“Active Ownership” by Elroy Dimson , Oğuzhan Karakaş and Xi Li - this paper, in my view, suggests that successful active engagement in a collaborative and constructive manner on material ESG concerns improves the fundamentals of a company and also increases stock returns. I differentiate this type of engagement with what one typical sees from “hedge-fund activists” or where board proxy fights occur; and where media engagements and open letters are used (although that type of activism has also seen positive returns see Klein and Zur, 2009). 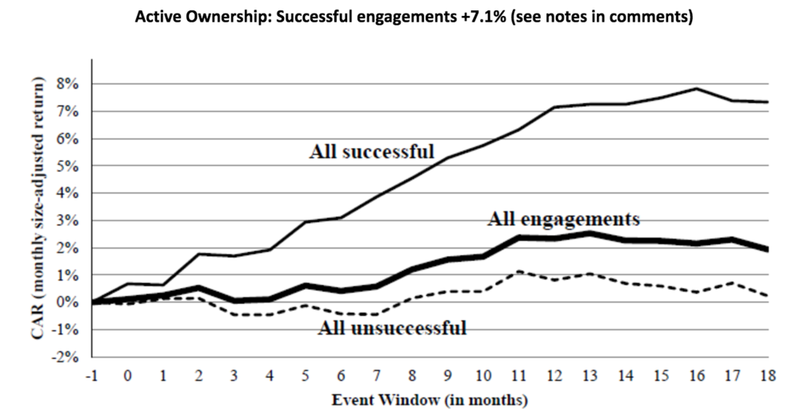 “To investigate the sources of the positive market reaction to successful engagements, we take a difference-in-differences approach and examine the subsequent changes in target firms’ operating performance, profitability, efficiency, institutional ownership, stock volatility, and governance after successful engagements relative to after unsuccessful engagements. We observe significant improvements in all these measures (i.e., an increase in firm performance, investor base, and governance, and a decrease in stock return volatility) following successful engagements, as compared to the unsuccessful ones. Particularly focusing on the ES and CG subsamples, we first find that the return on assets and the ratio of sales to the number of employees improve significantly one year after successful ES engagements, as compared to the unsuccessful ones; but such improvements are less pronounced for successful CG engagements. These findings support the view that successful ES initiatives enhance customer and employee loyalty. Second, we observe an increase in shareholdings by the asset manager, pension activists, and SRI funds one year after successful ES engagements; but such an increase is not apparent for successful CG engagements. These results support the view that ES initiatives generate a clientele effect among shareholders. Third, we find improvements in the corporate governance structure of targeted firms, as measured by the Bebchuk, Cohen, and Ferrell (2009) entrenchment index, two years after successful engagements on all ESG issues. This suggests that good ESG practices signal improving governance quality. The full methodology and discussion is in the link SSRN here (further bibliography in that paper to studies on the full range of stewardship to activism) . An overview of several Active Ownership studies is given by Share Action here. Summary slides given by Dimson on this paper are here. If one puts this work together with the work on the outperformance of Global Equity managers described here, one can start to build a defense of Active Management; where John Kay would argue Active Managers should compete on style and philosophy in any case. The chart above figure plots the cumulative monthly abnormal returns (CARs) around the initial engagements from one month prior to the engagement month to 18 months afterward. The chart examines the entire sample Each CAR is decomposed into the CAR for successful engagements (i.e., those that achieved milestones) and the CAR for unsuccessful engagements. For each event month, authors calculate the average abnormal return from holding an equally weighted portfolio of all target firms that initiated engagements in month 0. The stock returns are adjusted for Fama-French decile size-matched returns. The stock returns are winsorized at the 1st and 99th percentile levels before calculating the average CARs.